This Vintage Tele lead pickup uses alnico 2 rod magnets to provide a softer treble attack for players who want Telecaster tone without excess bite. The Alnico Pro Tele Lead uses a vintage coil wind, and sand cast alnico 2 rod magnets for a vintage sound and vibe, but with a smoky sweetness on the high end. You will still feel the Telecaster snap and twang, but with nice round warmth added in. Your pick attack will feel mellower, and chords will have a spongy bounciness.Pair with our Alnico II Pro Tele – neck The authentic look and sweet sound are brought together by waxed cloth hookup wire, standard .187′ diameter alnico 2 rod magnets, and a copper plated steel bottom plate. Like all of our pickups, its then potted in our wax formulation for squeal free performance. The Alnico Pro Tele Rhythm uses a vintage style coil wind, and sand cast alnico 2 rod magnets, along with a deep drawn chrome plated brass cover for a sweet, hollow tone that sounds great both clean and dirty. For players who dont use a pick, you’ll notice the response feels more balanced compared with pickups that use alnico 5 magnets. 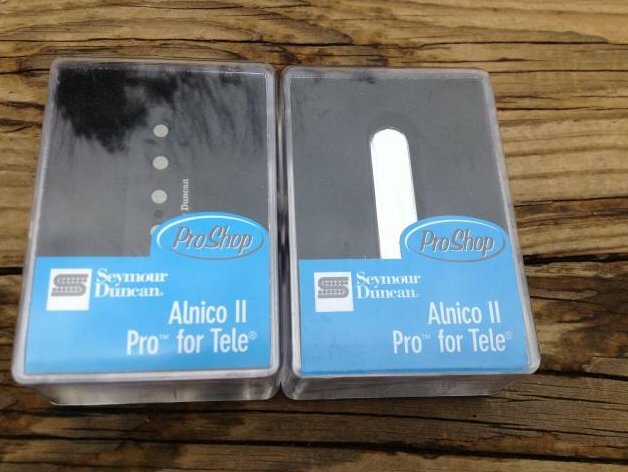 The Alnico Pro Tele Rhythm is RWRP to provide a hum cancelling middle position. Pair with our Alnico II Pro Tele – bridge Jerry Donahue Lead Tele Keeping to that authentic Tele feel, we hand assemble this pickup with alnico 2 rod magnets, the period correct color and thickness of Forbon, a deep drawn chrome plated brass cover, and cloth pushback lead wires. These are all lacquered and wax potted like the originals.